Job Designer - Schedule your rooms, employees and other resources with our all-in-one solution for generating quotes, invoices and reports. Link tasks, employees, equipment and other items from the user-defined database. Medical Calendar - Medical Calendar is handy scheduling software for doctors. It supports infinite number of profiles and has a well-organized navigation system. The scheduler allows you to password protect information and comes with a rich set of print templates. OrgScheduler LAN - A networking calendar and scheduling system. Calendar management is implemented at two levels: manager and users. The each user maintains his own calendar, and Workgroup manager can manage all calendars. 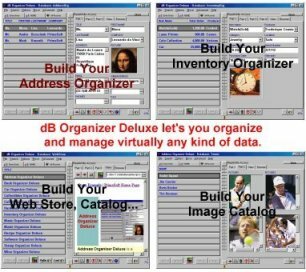 C-Organizer Pro - C-Organizer Professional is your one-stop organizer software including all the features you need in order to keep track of your appointments and tasks. It offers an advanced notification system and a place to store all your important information. C-Organizer Lite - C-Organizer Lite is a personal information manager with elegant design and all the necessary features: it lets you plan your day, set alarms and keep a Address Book with photos. Also this program includes a Tasks manager and a Notebook. Efficient Diary Pro - Efficient Diary Pro is a cross-platform, easy-to-use and powerful electronic diary software package. The product has a strong edit function similar to that of MS-Word. And you can sync data across PCs and mobile phones. EfficientPIM Network - EfficientPIM Network is specially designed for small to medium workgroups to share data! With network edition, different users in your organization can access the same copy of data, to work in conjunction and improve work efficiency! Efficient Diary Network - Specially designed for small to medium work groups to share data! To casting your unique corporate culture!